The Vintage Upright sound library features a carefully sampled Östlind & Almquist Piano, a classic Swedish brand dating back to the late 1800s and widely known for its quality, craftsmanship and heritage. This instrument was built in the 1930s and captures the essence of the timbre in a well-built Upright Piano. The frail, silvery treble, the bright, distinct mid range and the focused, round bass, all painstakingly captured in a world-class studio facility. 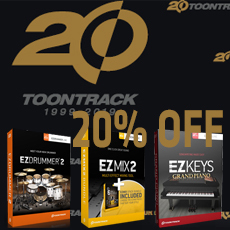 If you have registered at least one EZkeys Instrument already, you are eligible for the reduced "EZkeys Sound Expansion" to get the Vintage Upright Piano and save big! Ich verwende EZkeys mit Cubase. Nach dem üblichen teilweise lästigem Authorisierungsverfahren kann man gut mit diesem Programm arbeiten. Die Qualität der Sounds ist sehr gut. Hab leider noch nicht alles testen können, aber bin mir sicher, dass EZkeys für Tastenklimperer eine sinnvolle Anschaffung ist.